Frugal with a Flourish: Weekend Thrifty Finds - New in Package! Have you ever noticed how much stuff you can get at yard sales that was never used and new in package? I picked up some of that this weekend! Let's run down the finds! For starters, I got this cute print that is still in the wrapping for a dollar! Adorable! 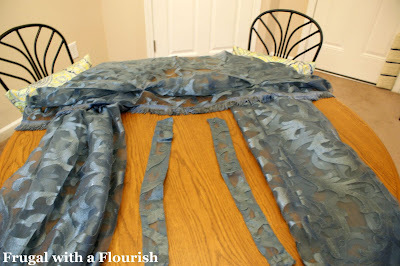 I think I am going to do a gallery wall and this will be a feature! Next, I found these cute sachets in a really nice clean scent! I am still debating if I keep them or gift them - but for .50 cents a piece they work for me! Finally - I got this 5 piece set of drapes. Not sure if it was new or not, but if it wasn't new the person who refolded them into the box with the cardboard and everything was extremely talented. For $2 I am willing to give them a try in the guest room. They have the same pattern as that fab quilt I found last weekend! I also found some pillowcases for $1 that were new in the package from Target and a cute planter that still had the price tag on it that they only asked $2 (original price was $4 so still a deal!). So let's hear it - do you guys every find new in package stuff when you are out shopping yard sales? Next weekend, if all goes well, I plan on hitting up the TN Rt. 52 Yard Sale! (It is the second longest in TN!) Drop me an email if you are local and wanna tag along! 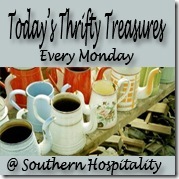 Linking this up to Rhoda's Thrifty Treasures Party over at Southern Hospitality! Join in the fun if you went out Thrifting this weekend too! Luv the pretty print...only $1.00? Great find! Great finds! I really wanted to hit the yard sales this weekend but had too many other things going on. You definitely SCORED!